Unfortunately, the development of pressure sores amongst nursing home residents frequently occurs as a consequence of neglect. Although sometimes unavoidable, these pressure sores often arise when facilities' staff fail to properly assess and take measures to prevent their development. When correctly following procedure and federal law, however, care practitioners will be armed with a comprehensive set of diagnostic criteria which enable them to monitor and assess the risk of residents developing pressure sores. By using these tools, nurses will be able to make the appropriate interventions when needed to ensure that sores do not develop. Although there are several diagnostic tools which practitioners can use, the most widely adopted and most important for you to know about is the Braden Scale. What does the Braden Scale Measure? What is a Normal Braden Score? How Frequently Should the Braden Scale be Used? What is the Braden Q Scale? What is the PUSH Tool for Pressure Sores? What is the Cause of a Pressure Sore? What is the First Sign of a Pressure Sore? How can the Development of Pressure Sores be Prevented? What Does it Mean When a Wound is Granulating? What Causes a Wound to Over-Granulate? What Type of Dressing Should be Used on a Red Granulation Wound? The Braden Scale was developed thirty years ago by nursing experts Barbara Braden and Nancy Bergstrom to help health professionals - especially nurses - assess a patient's risk of developing a pressure ulcer. The Braden Scale made large improvements upon the previously used Norton scale, which relied on fewer metrics and less precise criteria for evaluation. For the Braden scale, there are six criteria which are considered, each of which is ranked on a scale from 1 to 3 or 4, with the high score of 23 indicating no risk and the low score of 6 indicating the severest risk. The six criteria which the Braden Scale considers are Sensory Perception, Moisture, Activity, Mobility, Nutrition, and Friction & Shear. By evaluating all of these factors, the Braden Scale is able to assess both the proximate causes of pressure sore development (a lack of movement & activity combined with constant pressure on part of the body) as well as secondary causes (such as inadequate nutrition or inability to sense pain). A Braden score from 19-23 is considered normal, and not a risk of developing a pressure sore at the time of the assessment. Any score of 18 or lower is considered a risk, with 15-18 considered "At Risk," 13-14 a "Moderate Risk," 10-12 a "High Risk," and 9 a "Very High Risk"
In addition to being used upon entry, transfer, and dismissal, the Braden scale should also be regularly deployed to ensure that your loved one's health is being adequately monitored. In a hospital setting, the assessment should be performed daily. Although there is no agreement as to how often the scale should be used in a skilled nursing setting, it should always be performed on a regular basis, according to the facility's protocol, and frequently enough to prevent the development of pressure sores, which typically emerge within two to three weeks for residents of concern. The Braden Q scale is very similar to the Braden scale, but includes the additional diagnostic criteria of "Tissue Perfusion and Oxygenation." It was developed a decade after the original Braden scale with the permission of its primary author, and was modified to reflect the unique conditions of pediatric patients, especially in acute care settings. Outside of this context, you should expect that the standard Braden scale rather than the Braden Q scale will be used. The Pressure Ulcer Scale for Healing or "PUSH Tool" is the standard diagnostic mechanism used to assess and monitor pressure sores. Developed by the National Pressure Ulcer Advisory Panel (NPUAP) and released in 1997, the PUSH tool is similar to the Braden scale in that it assesses several factors and gives a total score based on the severity of the factors observed. However, for the PUSH tool the higher the score given, the more severe the pressure sore is. The PUSH tool measures three primary attributes of a pressure sore: the area or size of the sore, the drainage or exudate amount, and the type of tissue (extent of damage) observed. Based on these criteria, a total score from 1-17 is given. For your convenience, the PUSH tool can be found here. In addition, there are several risk factors which contribute to the development of pressure sores and enable or exacerbate their development. These include affected blood flow, lack of sensory perception, and inadequate nutrition and hydration. In a nursing home setting, you might see one or more of these factors contribute to the development of pressure sores. To prevent pressure sores from developing, if your loved one is relatively inactive ensuring sufficient mobility is a must, along with adequate care and attention to all of the other risk factors. Color - The skin over bony areas in particular may appear reddened. Also look for skin that appears bruised, with a blue, purple, or black hue. Temperature - Changes in temperature can indicate the early development of a pressure sore. The skin of affected areas may be warmer or cooler to the touch than the surrounding area. Consistency - When a pressure sore is beginning to develop, you may find that affected skin feels firm to the touch or boggy (as though it's filled with fluid). 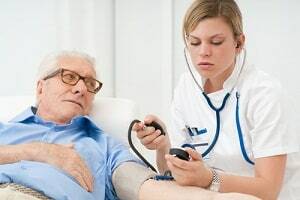 Sensation - If your loved one starts to complain about pain, itching, or tingling, that may indicate a pressure sore is developing in the affected area. The primary prevention for pressure sores is to redistribute pressure by ensuring that your loved one is adjusting their sitting or lying position regularly, or being regularly turned if they are unable to do so themselves. In addition, to avoid pressure sores it is important that they eat a balanced diet with adequate protein, whole grains, fruits, and vegetables, and especially that their skin is kept free from exposure to urine and stool. If your loved one is unable to adjust their position regularly, they should be turned every couple of hours - but not awakened in the night to do so. In addition, if you are concerned about the development of pressure sores, you can help prevent them by purchasing egg-crate or fluidized mattresses and/or chair pads, which help distribute pressure more evenly. Pillows are also a helpful way of reducing pressure on the skin near bony areas. Finally, to avoid friction it is recommended that you use a draw sheet to lift and reposition your loved one when necessary. To avoid shear, the use of footstools, ottomans, or other special devices to prop up the feet and keep hips at a 90-degree angle are helpful. The granulation of a wound is an intermediate step in the healing process of full-thickness wounds, which provides early scaffolding to promote healing from the edge of the wound. Don't worry, this is a good sign - it means the wound is healing properly! Granulation tissue is made up of new connective tissue and tiny blood vessels, so as you might expect it will be bright red or pink, and it is also moist. Granulation tissue is typically raised higher than surrounding flesh and often bumpy, thus the term granulating. The over-granulation of a wound occurs from the over-stimulation and production of new fibrous tissue (fibroplasia) and blood vessels (angiogenesis). This is a problem because it prevents epithelialization, the next step of the healing process consisting of the formation of the barrier between the wound and the environment. One of your best options for dressing a granulation wound is a collagen dressing, as these increase fibroblast movement leading to faster wound repair. Collagen dressings also facilitate the removal of dead tissue (debridement), the growth of new blood vessels (angiogenesis), and the formation of the wounds protective layer (epithelialization). There are several other advantages of collagen dressings, including flexibility, comfort, and a reduced chance of infection. The frequency of application depends upon the product, but typically ranges from daily to weekly. Whatever kind of dressing you choose, it is best to avoid occlusive and large pore foam dressings if possible, due to the risk of over-granulation with their use. Have you or someone you care about been harmed because a pressure ulcer was not properly diagnosed and treated? If you have been injured as the result of medical or hospital malpractice or negligence, call us at 800-553-8082 or get an online free consultation.